Yummy! 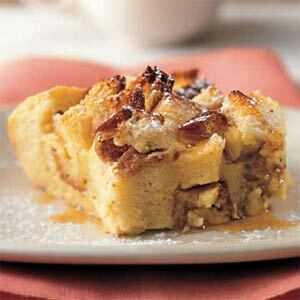 Try this sweet strata recipe! Great for those special mornings. Great holiday or Christmas morning Recipe! In a mixing bowl, beat the cream cheese and eggs with an electric mixer until smooth. Add the milk, half-and-half, maple syrup, and vanilla; mix until smooth. Pour the cream cheese mixture over the top of the bread cubes, cover, and chill for at least 2 hours or overnight if you want less work in the morning. Place the dish on the counter at room temperature while the oven is preheating. Bake for 45 to 50 minutes, or until set. Sprinkle with confectioners’ sugar or warm maple syrup just before serving.